ISLAMABAD: Federal Minister for National Health Services, Regulation, and Coordination (NHSR&C) Aamer Mehmood Kiani said that the National Essential Medicine List 2018 will be implemented in all provinces across the country for the benefit of patients. He said that the National Essential Medicine List (NEML) is an important element of national health system policies and practices and has proven to be a useful tool to help the country in selecting quality, safe, efficacious and affordable medicines. While he was addressing the formal ceremony for the dissemination of standardized list for essential medicine and launching of its mobile application, the minister emphasized on the availability and access of essential medicine for common people in the country. The minister said the access to essential medicines is part of the right to health and an important tool to provide access of quality medicines to the people of Pakistan. Cost-effectiveness is an important concern for the poor masses. 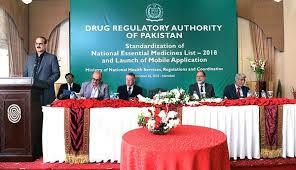 Drug Regulatory Authority of Pakistan’s (DRAP’s) CEO Dr Sheikh Akhter Hussain on the occasion said that NEML 2018 has been standardized in line with the World Health Organisation (WHO) Essential Model List 2017. The list of essential medicines is aimed at satisfying the primary health care needs of the population. It will provide guidelines to Basic Health Units (BHUs), Rural Health Centres (RHCs), and Tertiary Care Hospitals for the selection of essential medicine. The list is a commitment from the Government of Pakistan to ensure cost-effective ways to deliver equitable access to affordable medicines that are safe, effective, and aimed at improving the quality of patient care as well as clinical decision making. Addressing on the occasion, USAID Pakistan’s Mission Director Jerry Bisson stated that the National Essential Medicines List 2018 would enable policymakers and service providers to ensure an adequate supply of quality medicines across the healthcare continuum and would be instrumental in addressing the priority health problems of Pakistan. USAID Global Health Supply Chain (GHSC) project’s Country Director Dr Muh0ammad Tariq highlighted USAID’s support to the government and its impact on mother and children’s health in Pakistan. The event was attended by DRAP CEO Dr Sheikh Akhter Husain, USAID Mission Director Jerry Bisson, Pakistan Society of Health-System Pharmacist CEO, WHO Country Head Dr Nima Saeed Abed, and representatives from international and national health partner organizations.